The moment you lean back into the Dofover you'll instantly notice the perfect balance between firmness and softness. Firm enough to work, but soft enough to still feel comfy! Hate when your cushion slides out of place? The Dofover's adjustable strap helps keep it right where you want it! Not too small that it doesn't provide you support, but not too bulky that it's a pain to use and carry around! Its compact size lets you take it anywhere you want! No gross chemical smell that makes you sick and stinks up the room or car! Products Size: 34 * 32 * 12 CM/ 13.4" * 12.6" * 4.7"
ALLEVIATES LOWER BACK PAIN - relieve lower and mid back pain and tightness from long time sitting; support your lower back's natural curve to achieve the perfect spinal alignment and promote a healthy vibrant posture. Chiropractor recommended back support or lumbar cushion for surgery recovery and people who suffers from lower back pain, Piriformis, Lumbosacral Spondylosis, Fibromyalgia etc. 100% PREMIUM QUALITY MEMORY FOAM LUMBAR PILLOW - Our memory foam pillow is 100% pure and is made of the exact same material as the world's leading memory foam manufacturers. STURDY SUPPORTIVE AND EFFECTIVE - Ergonomic Streamlining molded with premium quality memory foam for optimal lumbar support cushion and never flattens out, a proper firmness memory foam compresses to take the shape of your back curve and provide comfort and relief numbness of your back. 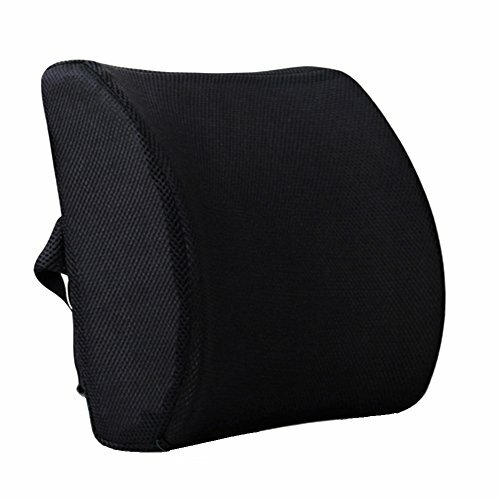 ADJUSTABLE STRAP - keeps the back support cushion in place and prevent the chair back cushion from sliding down, an extension straps make the lumbar pillow fits perfectly on any office chair, computer chair, gaming chair, executive chair, sofa, couch, car seat, SUV seats, truck seats, wheelchair and recliner seat etc. BREATHABLE REMOVABLE AND WASHABLE 3D mesh ventilative cover keeps air circulating so sweat and moisture doesn't fill it up, to keep you cool and comfortable all day long. Ideal for office gifts, business gift, back surgery recovery gift etc. Great gift idea for people sitting for long time such as office clerk, truck/taxi driver, game player etc. If you have any questions about this product by Dofover, contact us by completing and submitting the form below. If you are looking for a specif part number, please include it with your message.